Home > Car Care > When to replace engine splash shield and fender liners? The engine splash shield (under cover, under shield) protects the engine compartment from water and dirt. To a small degree it reduces the aerodynamic drag and as a result, improves highway fuel economy. In some cars, the engine splash shield redirects the air flow over the components that need to be cooled down, such as an oil pan or alternator. Do all cars have an engine splash shield? No, many older cars didn't have it. 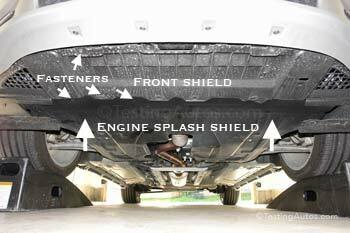 Most modern cars and SUVs have at least one splash shield under the engine bay. Some vehicles have several more under shields protecting other parts of the underbody. Many trucks have a metal shield instead. The engine splash shield may consist of several parts. 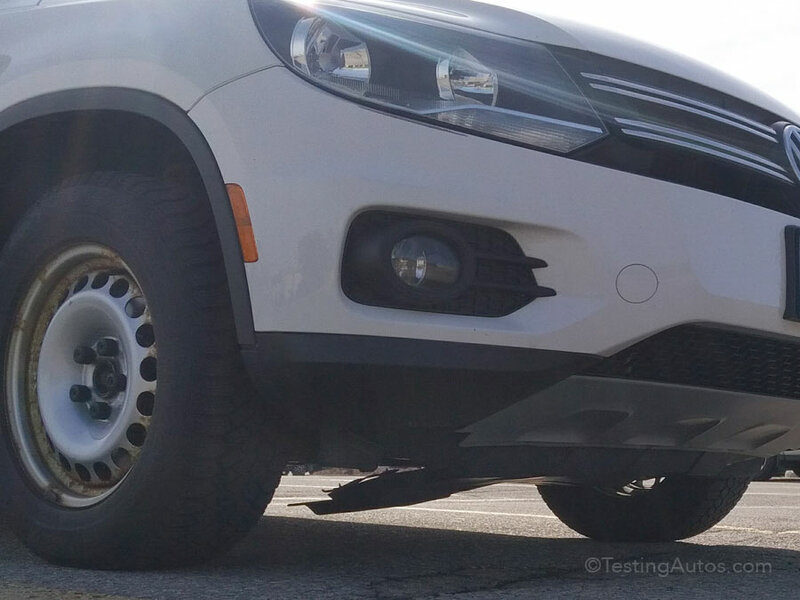 It might also be connected with the front fender liners. A fender liner (inner fender) is a plastic cover installed in the wheel well between the wheel and the fender. It protects the car body, wiring and other components installed inside the wheel well, see the photo below. What can cause the splash shield to break or come loose? Due to its location, it often gets damaged when driving over packed snow, road debris or when parking over the high curb. 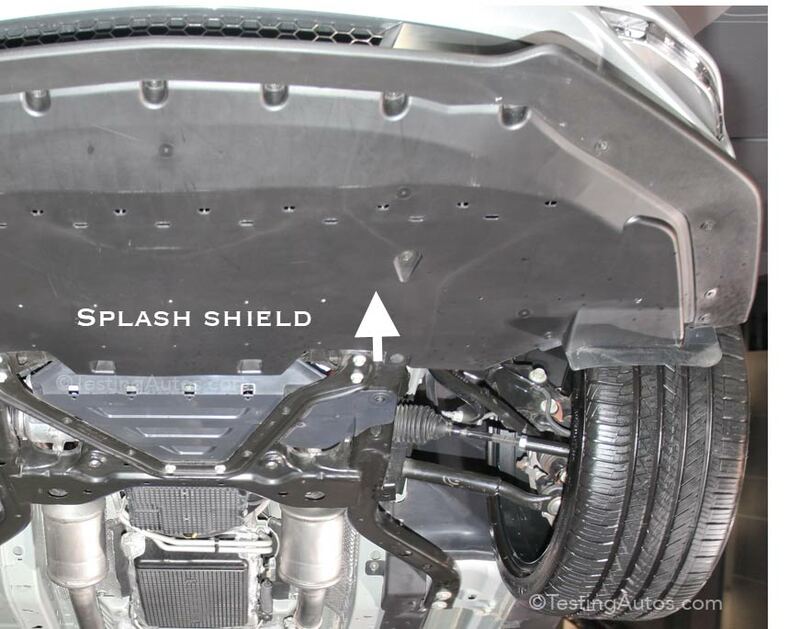 Some automakers design the splash shield so that it has to be removed every time when doing an oil change. Because of that, some of the fasteners that hold the splash shield wear out and get lost over time. You can spot a loose splash shield, as it may hang visibly low under the car, see the photo. A loose splash shield can also and make a flapping or scraping noise when driving. What happens if an engine splash shield or fender liner is missing? We have seen many electrical problems caused by a missing splash shield or fender liner. This is because they protect many electrical components and connectors located in the front wheel wells and around the engine bay from water and corrosion. Examples include a windshield washer pump, fog lights, headlight bulbs, fuse/relay box, horn, radiator fan. In many cars, if the fender liner is broken or missing, the water will be splashing right on the back of the headlight assembly. This often causes corrosion and other problems of the headlight wiring and connectors. The engine and transmission pan can also rust through over time if not protected. Problems like these are more common in the Rust Belt. If a splash shield or fender liner is loose, your mechanic might be able to re-secure it. If the shield is broken and cannot be secured properly, it must be replaced, because a loose shield might become a safety concern if it separates while driving. If the part is not available, your mechanic may recommend to temporarily remove it if it's safe to do. How much does it cost to replace an engine splash shield? The large center part is priced from $45 to $170. Aftermarket parts are cheaper; check prices online before ordering from a dealer. 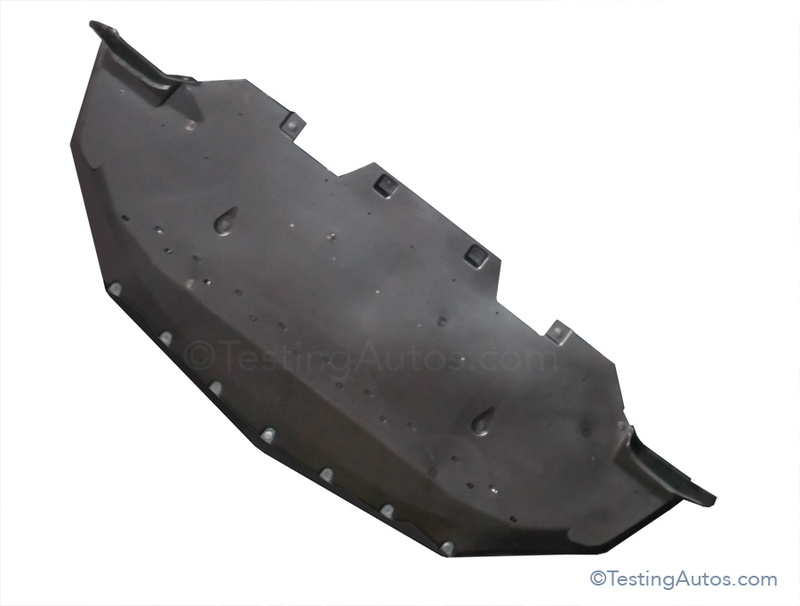 If there is a separate front piece and side guards, they are priced between $15-$50 each. You will also need some of the hardware (fasteners), such as clips and bolts, because old clips break easily. The labor charge may vary from $35 to $150. 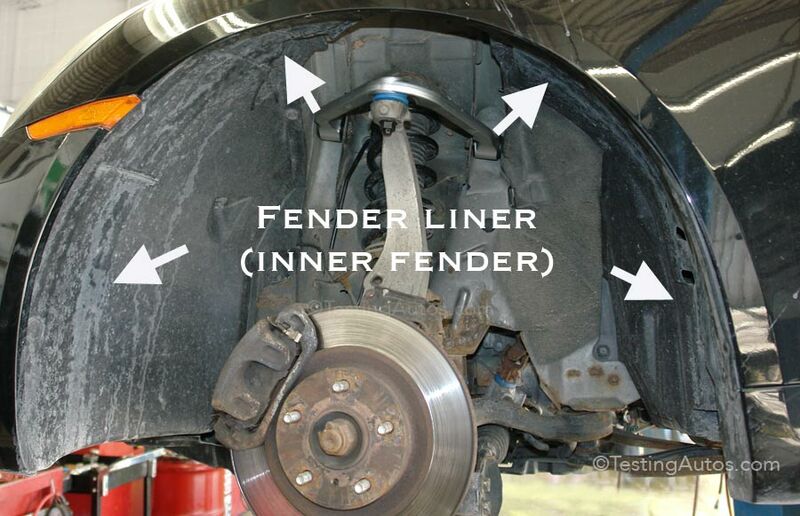 Replacing a fender liner (inner fender) will cost $45-$120 part plus $20 hardware, plus $35-$120 labor.